A HUMAN PERSPECTIVE East Africa is called the “cradle of humanity” because of the large number of prehistoric human remains found in the region. In 1931, Louis Leakey, an English archaeologist, began doing research in Olduvai Gorge, located in northern Tanzania. Olduvai Gorge has contained the most continuous known record of humanity. The gorge has yielded fossils from 65 individual hominids, or humans that walk upright. In 1959, Leakey and his wife, Mary Leakey, discovered a fossil there of a species called Homo habilis, the first human creatures to make stone tools. They lived about two million years ago. Throughout history, East Africa has been a crossroads of humanity because of its geographic position near seas and oceans. Bounded on the east by the Red Sea and Indian Ocean, East Africa includes Burundi, Djibouti, Eritrea, Ethiopia, Kenya, Rwanda, Seychelles, Somalia, Tanzania, and Uganda. Scientists believe that the world’s first humans lived there. East Africa was also a place where early civilizations developed. An important civilization was Aksum, which emerged in present-day Ethiopia in the A.D. 100s. Its location on the Red Sea and the Indian Ocean made it an important trading center and contributed to its expansion and power. People from Aksum regularly traded with the people of Egypt and the eastern Roman Empire. During the sixth century, however, Aksum lost many trading partners, and several geographic factors weakened the empire. Traders on routes between the eastern Mediterranean region and Asia began passing through the Persian Gulf rather than the Red Sea. In addition, the cutting down of forests and overuse of the soil led to a population decline, which reduced the empire’s power. 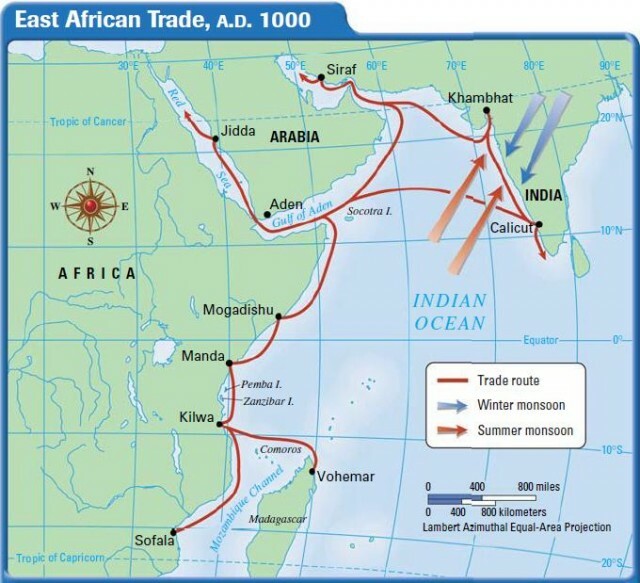 Around the seventh century, Arab, Persian, and Indian traders once again made East Africa an international trading center. By 1300, many trading cities dotted the eastern coast of Africa. The trading city of Kilwa emerged as one of the most important cities of the time. Kilwa flourished on the southern coast of what is now Tanzania. All this movement of goods, ideas, and people made East Africa a cultural crossroads. In the 19th century, Europe’s industrialized nations became interested in Africa’s raw materials. Those European nations wanted to colonize and control parts of Africa to obtain those resources. Europeans did not want to fight over Africa. To prevent European wars over Africa, 14 European nations convened the Berlin Conference in 1884–1885 to lay down rules for dividing Africa. No African ruler was invited to attend this conference, even though it concerned Africa’s land and people. By 1914, only Liberia and Ethiopia remained free of European control. Nations that attended the Berlin Conference decided that any European country could claim land in Africa by telling other nations of their claims and by showing they could control the area. The European nations divided Africa without regard to where African ethnic or linguistic groups lived. They set boundaries that combined peoples who were traditional enemies and divided others who were not. Europe’s division of Africa is often cited as one of the root causes of the political violence and ethnic conflicts in Africa in the 20th century. Ethiopia is one country that escaped European colonization. Ethiopia’s emperor, Menelik II, skillfully protected his country from the Italian invasion with weapons from France and Russia. In addition, the Ethiopian army had a greater knowledge of the area’s geography than did the Italians. As a result, Ethiopia defeated Italy in 1896. By the 1970s, most of East Africa had regained its independence from Europe. However, internal disputes and civil wars became a serious problem. For example, colonialism inflamed the peoples of Rwanda and helped to cause a bloody conflict in the 1990s. One cause of those problems was that European colonial powers had not prepared East African nations for independence. Furthermore, the ethnic boundaries created by the Europeans forced cultural divisions that had not existed before colonialism. Those cultural divisions often caused internal conflicts among native groups. Colonialism also greatly affected the economy of East Africa, which today centers around tourism and farming. Agriculture forms the economic foundation of East Africa. In addition, East Africa’s world-famous wildlife parks generate millions of dollars of revenue. East Africa is more than 70 percent rural. Since European colonization in the 19th century, countries have relied more on cash crops such as coffee, tea, and sugar, which are grown for direct sale. They bring in much-needed revenue but reduce the amount of farmland that otherwise could be devoted to growing food for use in the region. Relying on cash crops for revenue can be risky because the price of crops varies according to the world market. East Africa’s agricultural balance is changing, however, because people are leaving farms for greater economic opportunities in cities. For example, Addis Ababa, the capital of Ethiopia, has grown by more than one million people since 1991. However, such rapid population growth can put a strain on a city’s resources and a country’s agricultural production. One of the main economic activities in East Africa is tourism. The region’s vast wildlife parks in Kenya, Uganda, and Tanzania are world famous. In 1938, Europeans created the game reserves because they were killing animals for sport at a high rate. Most African peoples did not need the parks because they hunted only for survival. However, the wild animal parks, which are no longer used for hunting, have now become important sources of income for Africans, generating millions of dollars each year from tourists. Competing demands for the parkland exist, though. For example, Kenya’s increasing population requires more food. As a result, some groups want to eliminate or reduce the size of the wildlife reserves to create more farmland. Some desperate farmers have even begun to plow the land around the parks. East Africa’s position as a major trading region has given it a diverse culture. It is a melting pot of more than 160 different ethnic groups. Two major ethnic groups in East Africa are the Masai and the Kikuyu. The Masai, whom you read about above, are an East African ethnic group that lives on the grasslands of the rift valleys in Kenya and Tanzania. Most of the Masai herd livestock and farm the land. Typical Masai dress includes clothes made from calfskin or buffalo hide. Women wear long skirt-like robes, while men wear a shorter version of the robe. They often grease their clothes with cow fat to protect themselves from the sun and rain. The Masai are also known for making intricate beadwork and jewelry. The Kikuyu are the largest ethnic group in Kenya, numbering around 6.6 million. Their homeland is centered around Mount Kenya. Like the Masai, the Kikuyu traditionally were herders. However, today the Kikuyu live throughout the country and work in a variety of jobs. During British colonial rule, the Kikuyu organized a society called the Mau Mau, which fought against the British. The British killed around 11,000 Africans—mostly Kikuyu—during the Mau Mau rebellion between 1952 and 1960. The people of East Africa face many health care problems. The most critical is acquired immune deficiency syndrome (AIDS), which spread throughout Africa in the 1980s and 1990s. has become a pandemic and is having a devastating effect on the continent. A pandemic is an uncontrollable outbreak of a disease affecting a large population over a wide geographic area. AIDS is caused by the human immunodeficiency virus (HIV). People infected with HIV do not necessarily have AIDS and can carry HIV for years without knowing it. As a result, AIDS statistics can be misleading. The number of people who have AIDS lags behind the number of those infected with HIV. Though AIDS education is increasing, some governments hide the scope of the disease. Many doctors in Africa say that more AIDS cases exist than are reported. Some medical geographers predict that the populations of Africa’s worst affected countries could decline by 10 to 20 percent. You will read more about AIDS and other major health issues in Chapter 20. In the next section , you will learn about North Africa.